Boxes in QuarkXPress can have any shape that you want to give them. There are three kinds of QuarkXPress boxes: text boxes are containers for text; picture boxes serve as containers for pictures, illustrations, or PDFs; “no-content” boxes are just what they sound like — empty boxes, which are often used to create an area of color or a multicolor blend. You can optionally link text boxes together so that a story flows from one to the next, as shown here. If you accidentally make a text box when you need a picture box (or vice versa), don’t worry — you can easily change it. One way is to select the box, choose Item → Content, and then choose Picture, Text, or None. Another way is to ignore what kind of box it is and import whatever you want into it. For example, if you import a picture into a text box, it becomes a picture box; if you import text into a picture box, it becomes a text box. Rectangular Text box: Click and drag with the Text Content tool. Rectangular Picture box: Click and drag with the Picture Content tool. 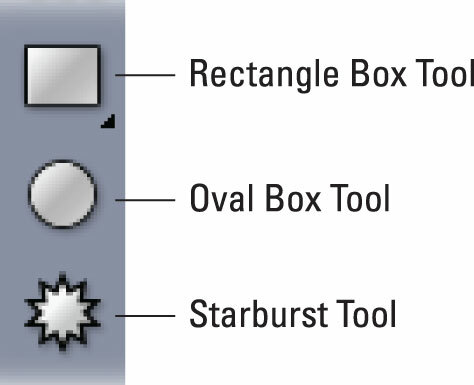 “No-content” box: Click and drag with the Rectangle Box tool, the Oval Box tool, or the Starburst tool (depending on what shape you want), as shown. You can also create a square with the Rectangle Box tool, or a circle with the Oval tool, by holding down the Shift key while creating the item. For extra fun, hold down the Option (Mac) or Alt (Windows) key along with the Shift key to draw the square or circle out from its center! This is handy when you want to draw a box or circle around another item. You can use the no-content Rectangle, Oval, and Starburst box tools to create a text box or picture box in those shapes. To make a text box, press T as you draw one of these boxes, or choose Item→Content → Text after creating it. To make a Picture box, press R as you draw a no-content box, or choose Item → Content → Picture after creating it. That’s all there is to creating rectangular and oval boxes!